All are welcome, but please RSVP to info@greentimbers.ca if you plan on attending. SNAP coordinator position We’re in the process of interviewing to hire a coordinator to replace Nathan Ross. We’ll introduce you probably within a few weeks! Amar, Nathan and Don continue to scan over 30 years worth of archived materials so neatly organized by Ellen over the past few years. Deanna, Jim and Bill are our members on this City-created committee. They last met January 14, where there was an update on the beavers by the lake (more on this later), and Bill suggested (with an illustration) an entrance arch where the new path starts at the corner of 140th Street and 100th Avenue. As the City grows this will become a major entry-point to the park. The story of beavers trying to flood out the forest prompted a small flood of emails from GTHS members and recipients of this email. There were lots of great suggestions. Thanks to everyone who responded. There are about five of the critters still actively doing what beavers do. Everyone wants to have them there, but ideally without killing all the trees and washing out the trails. There are several long-term options being considered. In the meantime the swale (what I would call a ditch) next to the path was cleaned out to allow water to flow. “Work was completed just before Christmas. An excavator was used to remove the buildup of debris. Three alder trees had to be removed in order to access the debris. 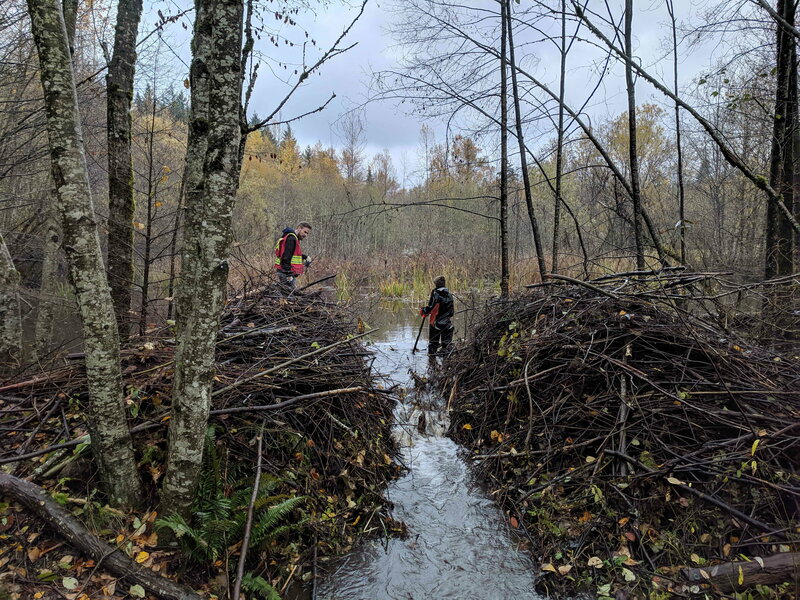 The beavers are still active and we have had to return to the site to install protective fencing around trees and to continue to notch the dam to allow water flow (at a lower frequency of site visits). As well, the drainage work on the west side of the trail was completed before Christmas. This work increased the capacity of the swale along the trail so that it can better manage the water from the marsh if it floods again. Eight trees had to be removed as they were growing within the drainage swale footprint. Feeling civic-minded? Love committees? Want to contribute? The city is looking for people to serve on the Environmental Sustainability Advisory Committee. Deadline is February 1, 2019. Here is the application. Please feel free to apply!